What do the best leaders have in common? As president of MAP, John Manning should know. MAP has helped tens of thousands of top executives accelerate their leadership and management performance. Manning says the answer is one word: discipline. But for Manning, discipline has a very specific meaning. All leaders have scores of things they could do. But a disciplined leader is one who identifies and focuses on the Vital Few: the 20 percent of activities that will drive 80 percent of the results. And the results that are most important are those tied to the organization’s most precious asset: its people. 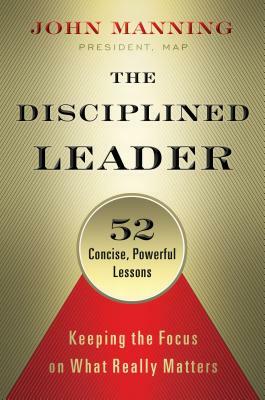 The Disciplined Leader offers fifty-two succinct lessons to help you home in on your own Vital Few in three critical areas: leading yourself, leading your team, and leading your organization. Each lesson comes with recommended tactics and practical “Take Action!” tips for implementing it, so there are literally hundreds of pieces of must-know, time-tested advice here. The chapters are self-contained, so you can read them in any order and come back to the ones that resonate with you—your own Vital Few! This is a hands-on, nuts-and-bolts guide to leadership practice that’s built to inspire action, drive change, and achieve results. John Manning is president of Management Action Programs, Inc. He has diverse experience in business leadership, having held executive positions in Fortune 500 companies in operations, marketing, and sales. Formerly the director of operations for McKesson Water Products, Inc., he was also part of a leadership team that took the company national. This move made McKesson one of the largest bottled-water companies in the United States. Katie Roberts is a freelance business and marketing writer/editor. She is a former television reporter, award‐winning magazine editor and writer, and a nonprofit business organization founder/director. —Guillermo de la Viña, CEO, Sigue Corp.